As we go back over hundreds of years ago and think about the first Thanksgiving it was a feast that began because of gratitude. Our history books chronicle the first Thanksgiving as a celebration between the Pilgrims and Wampanoag Indians. It was all about giving thanks for a fruitful harvest. This grand celebration three days in the making unfolded in 1621 at the Plymouth Plantation. Today, the holiday is the granddaddy of family celebrations here in the U.S. and Canada. And, frankly, it hasn’t changed much throughout the years. It’s a holiday where people that care about each other get together for a huge feast to celebrate gratitude and give thanks. Here, at Travisso, we are also a family. And, we are so very grateful each and every day for the opportunity to work in and serve the residents of this vibrant and growing community. So, we thought about all we have to be thankful for and made a gratitude list. It turns out the list is pretty long. Which is amazing because as we reflected on all of our good fortunes we realized it is because of all of the people in our lives. Our success is a cumulative effort of many different and talented people. We couldn’t do it without them. So, without much more delay, here’s our list of people and organizations that makes Travisso a tremendous place to live and work. Our amazing homeowners. They truly are the reason why we get up every morning. Travisso’s salespeople. Their experience and expertise are top-notch. New homeowners and potential customers. Without them we wouldn’t exist. The staff of our Homeowners Association. They do an amazing job overseeing and ensuring all aspects of the community are in tip-top shape. But, they do so much more including ensuring residents stay healthy, active, and social. This year our Thanksgiving gratitude list wouldn’t be complete without the Home Builders Association of Greater Austin on it. We are so very grateful to them for giving us the opportunity to showcase our amazing community during this year’s 2018 Parade of Homes. This massive event was the effort of a multitude of talented people from multiple industries. From the custom builders to the interior decorators to the publicists to the many volunteers that greeted guests, we can’t thank you all enough. Thank you! Thank you! Realtors. Again, without realtors bringing potential customers into Travisso it would be very hard for us to exist. We thank them for their continued support, commitment, and dedication to the Travisso community. Our partners and award-winning builders Toll Brothers, Taylor Morrison, Drees Custom Homes, and Highland Homes. Much thanks to all of them for their award-winning designs and expertly crafted homes. Travisso’s new premier custom home builders Aluxa Homes, Glazier Homes, Hill Country Artisan Homes, and Vogel Builders. Our co-workers for their all their help, support, expertise and kindness. All the vendors and individuals that we work with on a daily basis that provide us with essential products and services to keep Travisso up and running. Austin American Statesman readers that voted Travisso the Best Family-friendly Residential Community during the newspaper’s 2018 Best of the Best awards. In addition to all of the people that we work with, it goes without saying that Travisso wouldn’t be what it is today without the amazing backdrop of the Texas Hill Country. We are so very thankful for the spectacular views, gorgeous sunrises, and dramatic sunsets that are truly awe-inspiring and the cornerstone of our community. In closing, we would like to wish everyone a happy Thanksgiving filled with joy, hope, inspiration, and gratefulness. Wherever you hang your hat this holiday, remember to give thanks for all the people in your life that love and support you. And, enjoy! Travisso is a place to explore; a place to relax; a place to call home. We offer state-of-the-art floor plans from award-winning premier builders. Home buyers can choose homes ranging in size from 1,900 to over 5,000 square feet with prices starting in the 300s. And, there’s much more including resort style amenities and an outdoor landscape perfect for your active lifestyle. 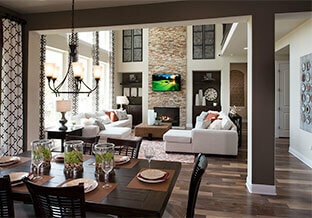 Visit Travisso in Leander today and explore our new model homes and neighborhoods.